Preserve your commodities and profits with an easy-to-set up and affordable Rushmore Building. Billions of dollars are lost every year because of external commodity storage. 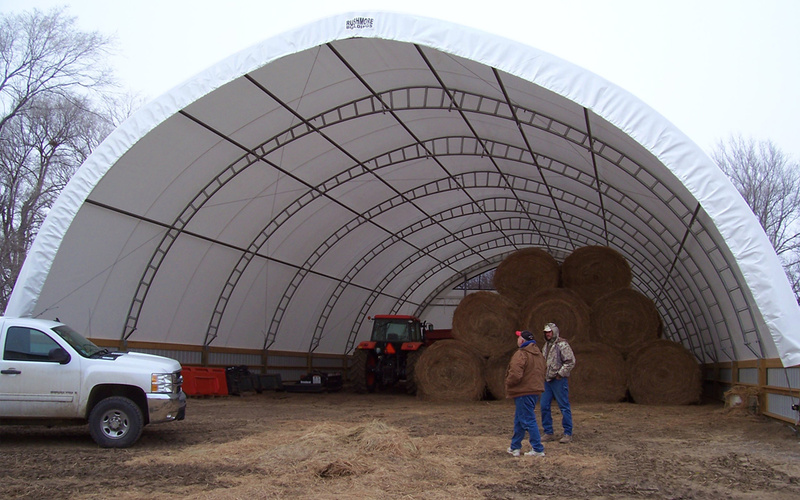 Our high density polyethylene canvas-covered buildings provide the ideal conditions for storing everything from grain, hay and feed rations to salt and gravel. Available in a variety of sizes and configuration, a long-lasting Rushmore Building can make the difference between a profitable year or not. In addition to being designed to stand-up to the most extreme weather, all our buildings offer an interior space that is completely open and column-free. This allows you to store more than regular steel buildings and move equipment around freely inside for faster and easier access to your commodities. Protecting your grain is easier with a Rushmore Building. The clear span design and high overhead clearance allows grain handling equipment such as augers and conveyors to distribute grain evenly throughout the structure giving you the most value from your space. When not in use for grain storage, your building will be ideal for storing virtually anything, including large equipment or fertilizer. Rushmore buildings provide a fast an affordable solution for all your storage needs. Our easy-to-erect, canvas covered buildings are available in Truss or Mono Tube and can be mounted on a wide variety of foundations. And unlike steel buildings, a Rushmore building can easily be moved and additions added simply if your storage needs grow. Give a call at 1-866-776-5617 to learn more and for a free estimate.